With this blog entry I will close my almost 3 year cycling adventure in Italy. It has been an incredible experience. I will dearly miss all of my friends here, especially everyone in Gruppo 1 who adopted me, and Eros Poli with whom I had memorable rides in France and an incredible visit to the Tour de France. Our flight back to the United States is at the end of this month. The next two weeks will be very busy getting things organized for the big move back to our home in northwestern New Jersey. I'm looking forward to seeing old friends, and making new friends. If you see me on the roads with my Gruppo 1 jersey make sure you say hello. I'm planning on continuing my blog once we get settled in. I think all my Italian friends will be intrigued about cycling in the U.S. Hopefully, they will come to visit. We took time some photos outdoors. More images from the museum, the last photo is of the view from the museum. Images from the Museo del Ciclismo which is adjacent to the shrine. More photos from inside the shrine. Well, my great cycling adventure in Italy is coming to a close. Ms. E and I decided a few months ago to return home to the USA and now the time is nearing to leave. Therefore, the Gruppo 1 club ride this past Saturday to the Madoona del Ghisallo happened to be a fitting end to the adventure. Madonna del Ghisallo is the patroness of cyclists, so proclaimed by Pope Pius XII during the 1949 Giro d'Italia. This tiny church is located on a hilltop in the northern Italian hamlet of Magreglio near Lago di Lecco. The shrine is filled with artifacts, photos, jerseys, and bicycles. Riders such as Coppi and Bartali have given their bicycles and jerseys to the church by way of thanks for winning races. You can also see the Caloi bike of Fabio Casartelli from the Motorola team on which he crashed and died from his injuries. The Museo del Ciclismo has opened a few meters away from the shrine. On May 31, 2006, Pope Benedict XVI blessed the the final stone of the building in the Vatican. We used the club van for the trip from Verona to the town of Pontida. There we dismounted our bikes and began our 45 km trip through the towns of Canzo, Asso, Pusiano and onto Magreglio da Erba where the shrine is located. 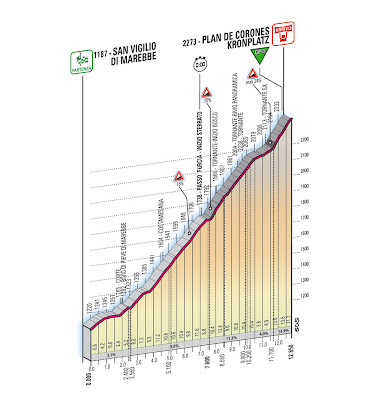 This is the "southern" route and less difficult than the "northern" route from Bellagio, 10% vs. 18% max grades. We spent about 2 hours at the shrine and museum. The museum is of an open design which I found very inviting. Lots of natural light made the viewing very comfortable. You could easily spend an entire there if you wanted to examine all the bikes, photos, and other materials carefully. See http://www.museodelghisallo.it/ for more information. After our visit we had an excellent lunch at a nearby restaurant. Then we climbed on our bikes and wound our way back to Pontida and finshed the day with 98 KMs. Photos: lake views on the way to Madonna del Ghisallo, we arrive, the shrine (note the two monuments in front, the one on the left is of Bartali, on the right Coppi), me next to the Coppi monument. Unsurprisingly, for as much as Americans desire Italian bikes, some Italians desire American bikes. Cannondale seems to be the the most popular American brand and TREK is gaining in popularity. You can also find a few Merlins around Verona as there is a dealer here. Chesini recently became a TREK dealer, in addition to selling their own brand, and sponsored a TREK Demo Day on Sunday, April 20th. On hand were about 20 bikes, evenly split between road and mountain. A stand was setup along the Lungadige (closed to automobiles every Sunday) and everyone was invited for test rides and eats. A TREK specialist was also on hand to answer questions. Speaking to Paolo later he told me the day had been very successful with a large number of people turning out on a beautiful day. 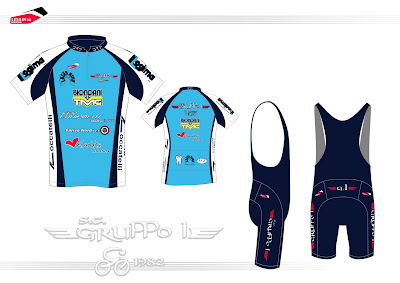 The club has decided to design and order new cycling kits. Everyone was tired of the old design which has been around for eons with some occassional updates. The company we used is LESSINIA SPORTING in Colognola ai Colli (http://www.lessiniasporting.it/). The individual TT up the Plan de Corones (stage 16, 26 May) should be very interesting. DiLuca (above, you can click on photos now to enlarge them) made an exploration ride a few days ago, looks like quite a mess up there. This climb was first included in the 2006 Giro but they didn't use the final section due to snow. With a 24% max and a gravel section at the end it's going to hurt. Bravo al suo esordio al Giro d’Italia, sfortunatissimo negli ultimi due (ha concluso da ammalato quello del 2006 ed è stato costretto al ritiro da una paurosa caduta nella tappa di Bergamo nel 2007), Francesco Bellotti, classe 1979, di Bussolengo, cresciuto nella formazioni giovanili dell’Ausonia Pescantina, alla sua sesta stagione tra i professionisti (è stato con Pantani nella Mercatone Uno nel 2003, poi per una stagione alla Barloworld, poi due con Pietro Caucchioli alla francese Crédit Agricole e da quest’anno ancora alla Barloworld), affronta il Giro d’Italia che scatterà sabato prossimo da Palermo con molta fiducia dopo le buone ultime prove. Bellotti aveva chiuso al 36° posto il suo primo Giro d’Italia ed aveva fatto pensare di poter guadagnare posizioni dei Giri successivi. E aveva cominciato il Giro 2006 con grandi speranze, che stava pienamente rispettando sino all’inizio dell’ultima settimana. Era l’uomo di classifica della Crédit Agricole, ma poi si ammalò ed è probabile che qualsiasi altro atleta nelle sue condizioni si sarebbe ritirato. Francesco, invece, ha voluto arrivare sino a Milano, affrontando il tappone che si concludeva all’Aprica (quello vinto da Ivan Basso su Gilberto Simoni con polemiche successive), tra sofferenze indicibili, vomiti continui, soste per recuperare un minimo di forze. A Milano fu 41°. Poi, il forzato ritiro l’anno scorso. Bellotti, pronto per il Giro? «Ormai la partenza è vicina. Con la squadra, la Barloworld, in questi giorni ci siamo trovati in ritiro e abbiamo provato i cambi per la cronosquadre di Palermo. E siamo andati a provare la tappa della Presolana. Inutile, per me, andare su altre salite che conosco bene come quelle dolomitiche». Soddisfatto della prima parte della sua stagione? «Al Giro del Trentino sono andato proprio bene con il quinto posto finale in classifica. Mi dispiace aver perso il podio per soli tre secondi, ma in salito sono sempre stato al passo dei migliori, ho disputato una buona prova a cronometro e, nella classifica finale, mi sono messo dietro tutti i pretendenti alla maglia rosa». Quali saranno i suoi compiti al Giro? «Vado senza ambizioni particolari e senza pormi limiti. Il leader è il colombiano Soler. Abbiamo Gasparotto per le tappe, ma la squadra conta molto su di me, sia per i piazzamenti fatti prima del Trentino, sia per come mi sono comportato in quest’ultima corsa, in particolare in salita. Non mi faccio grosse aspettative. Poi dipenderà molto da come si metterà la corsa. Se ci sarà spazio, cercherò di approfittarne. Se Soler sarà in maglia rosa, tirerò per lui». Soler è uno spauracchio per gli italiani. «Penso potrà fare molto bene in salita. Al Trentino, mi ha anche aiutato sulla Mendola. E’ scoppiettante. Sarà tra i protagonisti. E’ un colombiano atipico, perché è alto quasi 1.90 ed è tutt’altro che fermo a cronometro. Al Tour, ha dimostrato di essere uomo solido per tre settimane. In squadra, siamo fiduciosi, anche perché abbiamo uno come Pfannberger che è sempre stato nei primi dieci nella classiche del Nord, due campioni del mondo del quartetto come Cummings e Thomas, utili per le cronometro e un uomo di esperienza come Cardenas. E’, comunque, una squadra improntata sulle salite, visto che non ha un velocista». Dove si deciderà la corsa? «Penso che dalla tappa che partirà da Verona in poi, ogni giorno potrà essere decisivo. Ma non escludo sorprese da tappe che, sulla carta, appaiono più abbordabili». Quali sono i suoi favoriti? «Vedo su un buon livello Di Luca, Savoldelli, Simoni, Nibali, Pellizotti, Bruseghin. Insomma, più o meno, sono i soliti noti, Riccò? Può fare bene o male, essere la mina vagante, ma non mi dà grande fiducia. Ritengo che questo sia un Giro per corridori d’esperienza: vista la quantità di tappe dure, che richiederanno attenta gestione delle forze, penso che prevarrà un corridore d’esperienza». VR Moto is a small shop specializing in Bianchi bikes and more recently Basso. They typically have on display all the Bianchi models. The shop is unusual for Verona in that they also sell scooters. The owners, Elisa and Demis, are very friendly and helpful. They also are the owners of a factory that manufactures chamois. These are sold to companies in Italy, and worldwide, that make cycling clothes. The shop is located at the end of Corso Milano at via Croce Bianca, 14. It's a bit out of the historic center of Verona but can be easily reached by city bus or a short taxi ride. If you arrive in the morning they will treat you to a good espresso. After the raduno the participants eat and drink. After the raduno the club also has a tradition of lunch at the club's HQ to celebrate a successful raduno. Photos: riders get their panini and pasta, pasta ragu, lots of wine; at the club HQ we celebrate with classic Veronese dishes (bollito misto with peara') and more wine (note 7 bottles on one table). April 20th was our club's turn to sponsor a raduno. It was a gorgeous day and 430 cyclists registered for the event (there is only "day of" registration). Our event is very popular for several reasons: a great route, good food (pasta, sandwiches) and wine after the event, and nice prizes (based upon the number of participants per club). Our club President, Beppe, invited Eros Poli to join us which was nice. You can see from one of the photographs that lead vehicles block the roads for the peleton. Do they do this anywhere else in the world for what is basically a social ride?